BMW has a rich heritage when it comes to producing dynamic and engaging cars that are also capable of a grand tour – with the roof up or down. The BMW 327 Coupé and Sports Convertible of the late Thirties and the BMW 503 Coupé and Convertible from the Fifties were ideal in this regard. In more recent years, the BMW 6 Series Coupé of the Seventies and Eighties and the BMW 8 Series Coupé in the Nineties exemplified the genre. Already an iconic statement in style, the 2011 BMW 6 Series Convertible features an even more powerfully contoured roof while the sweeping bonnet, set-back passenger compartment, long wheelbase and flat waistline embody more than any other BMW the key design DNA of the marque. Two BMW turbocharged petrol engines, a newly developed chassis and a host of driver assistance technology ensure the new BMW 6 Series Convertible isn’t all show and no go. The BMW 6 Series Convertible is instantly recognisable thanks to its long sweeping bonnet, set-back passenger compartment and the unique fins of the soft-top. Complementing the fins is a more agressive “shark nose”, with a large, forward-slanted BMW kidney grille, broad air intakes, wide, contoured bonnet and new muscular wheel arches. The feeling of surging forward through water continues throughout the fluid lines of the car: the designers took their inspiration for the harmoniously curved surfaces of the body from the movement of the waves sent out by the bow of a boat. Continuing the theme, the waistline surface, which leads the body into the interior, mimics the character of a boat deck. High-quality chrome elements, such as the fog lamps consisting of a string of three LED units, on the outer edges of the front apron further accentuate the width of the car while the standard xenon headlights have BMW’s familiar double corona look. One of the major talking points of the BMW 6 Series Convertible is its fabric roof which is marvel of structural engineering that gives it the distinctive “fin” architecture. The multi-layer roof – which has been optimised in terms of its acoustic properties, thermal insulation and structural rigidity – has fins projecting out along the flanks of into the rear section, accentuating the car’s gracefully sweeping silhouette even more elegantly than on its predecessor. This means the transition from roofline into the boot is achieved as smoothly as on a coupé. It also means that the upright, heated, glass rear window positioned behind the rear seats can be lowered separately from the roof. The automatic opening and closing operation for the roof is activated as standard using a button on the centre console. The Comfort Access option allows the roof to be opened or closed using the remote control button on the car key. Opening the roof takes 19 seconds, with closing taking 24 seconds. Both operations can be activated while on the move at speeds of up to 25mph. The roof of the new BMW 6 Series Convertible is available in three colours, including a new Anthracite Silver effect. The cosseting new interior has extra space and all the style you would expect of a super-coupe. Newly developed lightweight sports seats (comfort seats are now an option) have an integrated seatbelt system, and Easy Entry function to the rear passenger compartment: a brief tap of a switch automatically moves the seat as far forward as possible. Both the standard Dakota leather and optional Exclusive Nappa leather come with BMW’s exclusive SunReflective Technology: a special treatment of the leather integrates colour pigments which reflect the infrared rays of sunlight, significantly reducing the build-up of heat on the surfaces when the car is parked with the top down. The new BMW 6 Series Convertible is available from launch with two petrol engines: the 650i and 640i. Confusingly as is now often the case within the BMW range the numbers no longer signify engine capacity but are used to differentiate power levels. The 4.4-litre V8 engine in the new BMW 650i Convertible is unique in that the twin turbochargers are positioned in the V-shaped area between the cylinder banks. This design results in more efficient use of space and greater engine efficiency. A maximum 407hp is developed between 5,500 and 6,400rpm, with peak torque of 600Nm available between 1,750 and 4,500rpm. 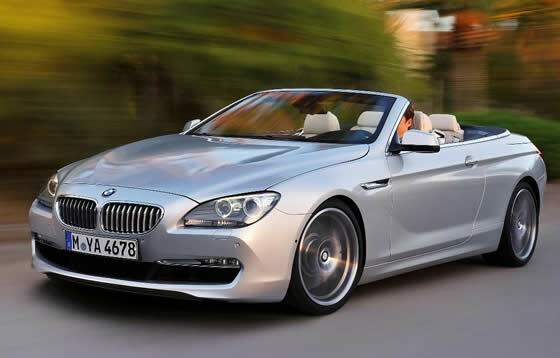 The new BMW 650i Convertible sprints from zero to 62mph in 5.0 seconds, with a top speed limited to 155mph. For a model of such performance, it is also surprisingly efficient, with average combined fuel consumption of 26.4mpg and CO2 emissions of 249g/km. The six-cylinder in-line engine in the new BMW 640i Convertible uses single turbocharger technology alongside petrol direct injection with Valvetronic fully variable valve control. This enables the 3.0-litre unit to develop a maximum 320hp at 5,800rpm and maximum torque of 450Nm between 1,300 and 4,500rpm. This engine propels the BMW 640i Convertible from zero to 62mph in 5.7 seconds and on to an electronically limited top speed of 155 mph. Perhaps even more remarkable are its efficiency figures. The BMW 640i Convertible achieves 35.8mpg on the combined cycle, while CO2 emissions are only 185g/km, proving that at BMW luxurious sporting performance does not come at the expense of economy. Achieved with help from an automatic transmission that features Auto Start-Stop technology and an automatic active air flap control behind the car’s kidney grille for optimum engine performance. Both 6 Series Convertible models come with technology such as Brake Energy Regeneration, Electric Power Steering (EPS), the need-based operation of ancillary components and intelligent lightweight construction to ensure maximum efficiency as standard. An eight-speed Sport automatic gearbox is standard fitment on both models, and its wide range of ratios offer a perfect balance of muscular, sprinting performance, refined high speed cruising and low speed efficiency. The new BMW 6 Series Convertible is designed to be adjusted to fit with the drivers mood. Drive Dynamic Control allows drivers to choose how responsive they want the gearbox, steering and throttle to be, while the Adaptive Drive system is available as an option with electrically controlled dampers and anti-roll stabilisation. In addition to the standard electromechanical power steering, another unique feature in this segment is the optional Integral Active Steering system. This system combines Active Steering for the front axle with a steering rear axle, allowing the steering angle and power assistance to be controlled at both the front and the rear with the help of electric motors. This precisely harmonised system offers extraordinary agility in dynamic driving situations, while allowing for an impressively deft touch around twisty mountain passes and in city traffic. In the interests of weight optimisation, the doors, bonnet and front axle spring mounts are all aluminium, while the front side panels, roof lid and boot are made from glass fibre composite. Torsional rigidity is now around 50 per cent greater than that of its predecessor. Longer, lower and wider, the new car is larger in every dimension than its predecessor except height, where it now stands nearly a centimetre closer to the ground. At 4,894mm in length, the new model is 74mm longer than its predecessor, while the wheelbase has stretched similarly, to 2,855mm. The car has also grown by 39mm in width, and now measures 1,894mm across, while 9mm have been shaved off its height, to 1,365 mm. Typically, 2+2 convertibles are compromised in the back, but the increase in dimensions means that passengers in the rear seats also benefit from additional legroom. Another area often compromised on soft tops is boot space, but even with the roof down, the 300 litres available in the new BMW 6 Series Convertible allows enough room for two golf bags. With the roof closed, boot capacity reaches an impressive 350 litres. BMW ConnectedDrive in the new 6 Series Convertible provides a range of unique systems and services such as: Surround-view, BMW Night Vision with pedestrian recognition, Parking Assist, Lane Change Warning System, Lane Departure Warning System, and Speed Limit Display are all offered. The new BMW 6 Series Convertible is also the only car in its segment to be available with a Head-up Display. The latest generation Head-up Display system uses a broader palette of colours and three-dimensional graphics to create an even sharper image. A 12 GB hard disk can store numerous forms of music, while BMW Online systems connect the driver and passengers with the wider world through an integrated SIM card. It isn’t all play and no work though: BMW is the first carmaker in the world to offer in-car email display via Bluetooth. In the new BMW 6 Series Convertible, owners of a BlackBerry smartphone can access their mobile phone’s email folder using the iDrive control system. Using a new Bluetooth interface to integrate the BlackBerry into the vehicle, it is possible to receive emails, show them on the Control Display and have them read to you aloud using a text-to-speech function. The new BMW 6 Series Convertible comes with the highest ever level of standard specification on a Six. Standard for the 640i Convertible are 18-inch light alloy wheels, while the 650i Convertible comes as standard with a 19-inch light alloy wheel. Both derivatives feature Dakota leather upholstery, eight-speed Sport automatic transmission, electric seat adjustment, BMW Professional Multimedia Navigation system, Xenon headlights, LED front fog lights and front and rear Park Distance Control to name but a few of the standard specification highlights. 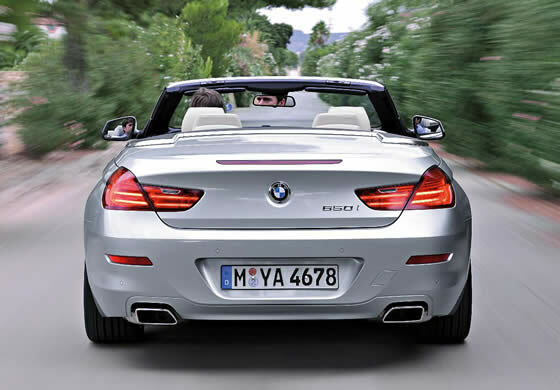 The BMW 6 Series Convertible goes on sale in the UK on 26 March, 2011. Prices will be announced at a later date. Convertible Car Reviews - BMW 6 Series Convertible Review.